The PRO Series P500 is made for the master griller. With the infrared side burner and back burner, 9.5mm stainless steel wave rod grids and up to 80,000 BTU's, this grill's heat capacity is prime. Backlit knobs, a built in ice bucket, JET FIRE ignition, and the all stainless steel exterior only add to your grilling experience. 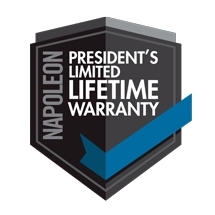 Whether you are enjoying an evening of grilling with just the family, or entertaining for many, the Napoleon PRO Series P500 IRSB will meet all of your expectations.